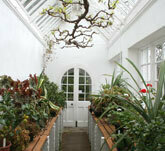 A conservatory was originally a place to conserve plants by protecting them from frost. But 'conservatory' is more often used today to describe a solarium, winter garden or sun room - a place to be indoors while enjoying the plants and sunshine one would normally enjoy out of doors. This type of conservatory, often built in cast iron, was popular among rich people during the nineteenth century. It then fell from favour but returned to popularity in the last quarter of the twentieth century. an adjustable sunscreen (eg slats) outside the conservatory roof. frosted glass or polycarbonate sheeting with white stripes also reduces glare. A conservatory is on the north side of a building can be much more comfortable as an everyday living space, without the need for protection against the sun. Artists have always liked north lights: they have a kind and beautiful light. A north-facing conservatory can also be an excellent place to grow orchids. Window panes: small panes of glass have the surprising effect of making the conservatory seem larger than if it were glazed with large panes of glass. You can use a mix of larger bars for structural purposes and smaller bars for glazing. Double or tripple-glazed units should be used. Conservatory roof glazing: glass can be used, and is beautiful, but polycarbonate sheeting (preferably 5-wall) has the advantages of high strength and good insulation. After cutting, saw dust should be blown from inside the polycarbonate with compressed air (this is best done in the factory, before delivery). The panels should then be sealed with impervious tape at the top end and with porous tape at the lower end. It is important to select a good quality glazing bar system which allows for expansion and contraction of the polycarbonate prevents water penetration.